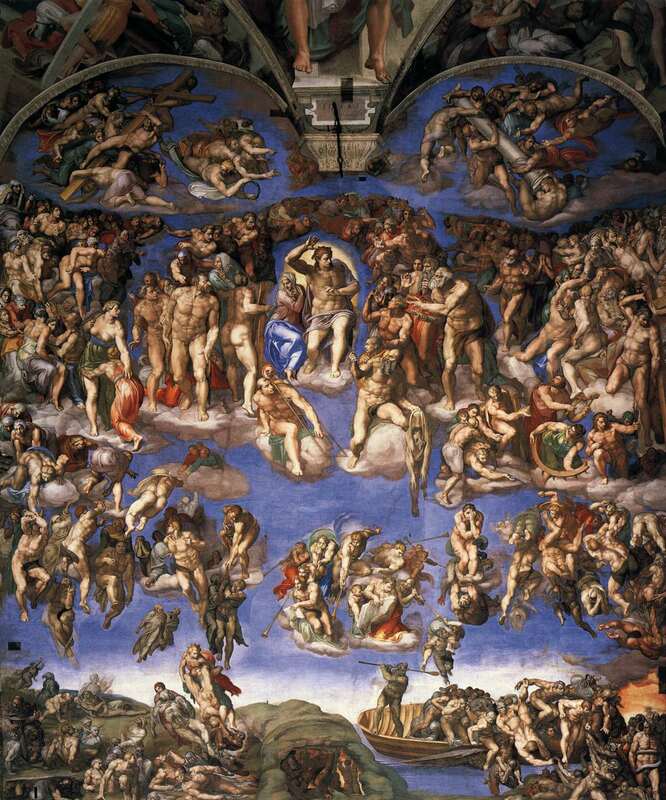 The exact textual sources that Michelangelo referred to while painting his Last Judgment are disputed, but as the artist in question was both an extremely learned man and a devout Catholic, it is reasonable to assume that he read the Latin Vulgate Bible.1 St. Jerome translated the original Greek of the New Testament in the fourth century for the text, and it is viewed today as one of the most influential pieces of writing in Latin. Greek, the language of many Christians during the religion’s early stages, was the common tongue of the lower classes. This posed a problem when St. Jerome approached it, as the emotional and historical importance of the Bible would demand the very highest of Latin. The result is fascinating and innovative. The translation reflects the fact that it is not a high style– it is straightforward, simple, and clean– but it is still quite beautifully styled. It is powerful, faithful, and accessible to both the highest of priests and the types of common people who were responsible for the production of the original Greek text. It determined how people read and wrote Latin for centuries to come. Luke 12: 4-5 does not describe the scene explicitly, but does give a clear warning. This is some pretty frightening literature. And when we look at traditional depictions of the scene, such as the structured and explicitly didactic one done by Giotto, an earlier Renaissance master, we find the sinner’s fear of hellfire and the blissful, golden promise given to the sinless. To Christ’s right, the saved are in tidy, pastel registers. To Christ’s left, the naked damned are cast into impenetrable shadow, flame, and chaos. It reads as both a clear warning and a promise, much like Luke’s. Now let’s turn to Michelangelo’s interpretation, which is found in The Sistine Chapel in the Vatican Museums. The fear and the distress is still present to Christ’s lower left, and it is still a stomach-turning scene– even if there are fewer demons and the hellfire has been reduced to a pale orange suggestion. The true departure from tradition comes just about everywhere else. Gone are the rows of neatly-arranged blessed to counter the tortured masses of the doomed. The twisted, distorted bodies on Christ’s left continue to his right; the only difference between the two sides are the direction in which the masses are moving. Hellish chaos and heavenly stillness are replaced by a cycle of perfectly-sculpted flesh swirling around Christ like so many muscly gnats. And there is no harsh darkness, either; the entire scene is swaddled in blue. The simplistic divide between the two sides of the composition is eradicated. In its place is a more complex arrangement of emotions and moods. The scene is rendered less artificial and more temporal; it may read less like a lesson, but like St. Jerome’s translation, it is accessible. After all, the apocalypse would be a fearsome thing to behold for all witnesses, whichever side of Christ they fall on. This innovation has not been universally appreciated throughout history. Today’s blog post will end with an excerpt5 from Percy Shelley, a Romantic poet who lived6 and is buried7 in Rome, that is vastly entertaining (even if you disagree with him). I cannot but think the genius of this artist highly overrated. He has not only no temperance, no modesty, no feeling for the just boundaries of art…, but he has no sense of beauty, and to want this is to want the sense of the creative power of the mind. What is terror without a contrast with, and a connection with, loveliness? … On one side of [Christ] are the elect; on the other, the host of heaven; they ought to have been what the Christians call glorified bodies, floating onward, and radiant with everlasting light (I speak in the spirit of their faith) which had consumed their mortal veil. They are in fact very ordinary people… Such is the famous ‘Day of Judgment’ of Michael Angelo; a kind of Titus Andronicus in painting, but the author surely no Shakespeare. Some of his influences come clearly from outside of the Catholic canon, as well. Characters from Dante’s Inferno can be seen in the bottom right side of the work. The text is here. The translation is here. Text is here. Translation here. The text is here. Translation is here. It was extremely hard to resist including more text from this section of the Bible than is strictly relevant to this post, so I’ll just have to urge you to read more of it on your own. For the full fire-and-brimstone experience, read Revelation 19:11-20:15. Letter to Peacock, 25th February 1819. He is honored at the Keats-Shelley House by the Spanish Steps. You can still visit his grave today.